All the Features you'd expect in a HOOSIER! Pricing Information: The Base Rate Price for the Hoosier Beauty Cabinet $3,750.00 plus optional features, shipping & handling. See optional features page for option pricing. You may also download the order sheet for a complete pricing breakdown. Professional construction with strong, interlocking joints. Solid oak & oak panel construction just like the original Hoosiers. Smooth sliding, solid oak tambour doors. Exact replica latches are embossed with the traditional "H" motiff. Brass leg skirts, ant traps, and wooden casters. Professionally sprayed finish, hand rubbed and satin smooth. Tin Bread Drawer with sliding top. Standard equipment on our Hoosiers! Four drawers with solid oak fronts, sides and backs. Smooth rolling, hidden drawer slides. Large adjustable shelf in upper cabinet area. Solid brass Hoosier name plate. Your choice of solid brass or nickel coated hardware. Important! Find out why our Hoosier cabinets are the best money can buy! Check out the additional information at the bottom of this page! are the BEST MONEY CAN BUY! #1 - WE USE THE BEST MATERIALS! We use only the best materials available. Our oak is carefully kiln dried to eliminate warping and splitting. Each piece is expertly cut to highlight the best grain patterns and quality of the wood. Our ply panels are all excellent quality ROTARY CUT with one piece veneer sides as opposed to straight book matched veneer panels with lots of pieces. What does that mean? Our panels have a beautiful wood grain pattern flowing gracefully from one side of the panel to the other and will not seperate between pieces of veneer. It costs up to four times more for this grade of panel but I think it's worth it! Another important difference is that all of our interior components are made of SOLID OAK! It would be faster and cheaper to use 3/4" plywood, but THAT'S ANOTHER REASON WHY OUR CABINETS ARE THE BEST! #2 - OUR OPTIONS COME INSTALLED! Read the fine print! Other Hoosier builders will make YOU install the optional features or add on a charge to do it for you. Have you ever installed a flour bin? How about a sugar bin or a carousel spice rack? Do you feel comfortable drilling holes in your new cabinet? 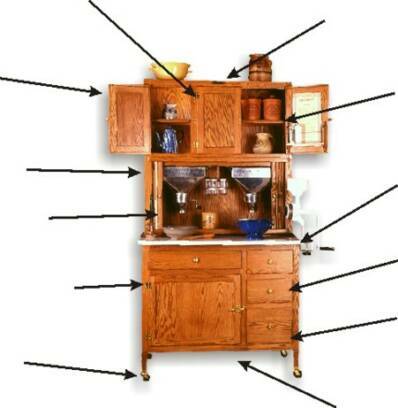 When you order a Hoosier cabinet from us, all of your options will be installed by us. You will only need to unpack your Hoosier and connect the top to the bottom and tap in your casters. Assembly takes just 10 to 15 minutes! The only option we don't ship installed is the food grinder bracket (for shipping reasons) and it easily connects with two bolts. We completely assemble the cabinet with all options and test everything before we ship it to you. We don't play pricing games. Make sure you get the full price quote for INSTALLED optional features when you compare price! #3 - NO "COOKIE CUTTERS" HERE! We specialize in building the Hoosier Cabinet YOU'VE ALWAYS DREAMED OF! Our cabinets are not cookie cutter, assembly line products. If you want something special or unique, just ask! We'll even log the progress of your custom Hoosier on our web site so you (and your family and friends) can watch us customize your Hoosier! See the Custom Hoosiers Page for more details!